If you’re new to First Day of Home, welcome! 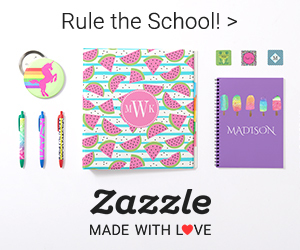 This is a place where crafters, home decor enthusiasts and DIY-ers can find inspiration for their next project, large or small. 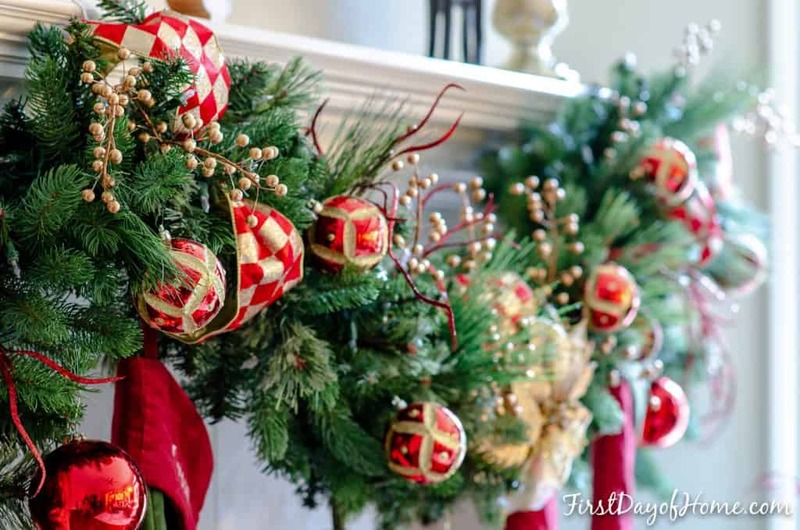 This year, I’ve partnered with over 20 other bloggers on the Christmas Tour of Homes. I hope you’ll visit their lovely homes at the end of this post. Big thanks go to Carol of The Red Painted Cottage , Sherry of Savvy Apron and Nicki of Sweet Parrish Place for their hard work organizing this tour! 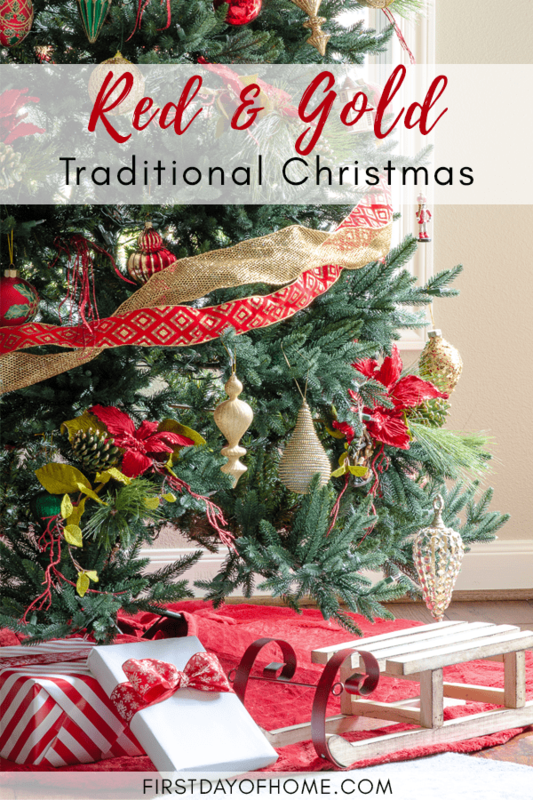 As I began planning my Christmas tree decor, I realized much of my style is inspired by Christmases spent with loved ones. Red and gold are traditional colors that may set the stage, but my tree has so many other secrets to unlock. It started with a red and gold Christmas wreath. Years ago, when my husband and I were first married, I wanted to design my first Christmas wreath to hang over our mantel. I enlisted my mom’s help, and we quickly fell in love with the red and gold checkered ribbon you see throughout the wreath and garland. I’ve since made several holiday wreaths and recently published this tutorial with step-by-step instructions. 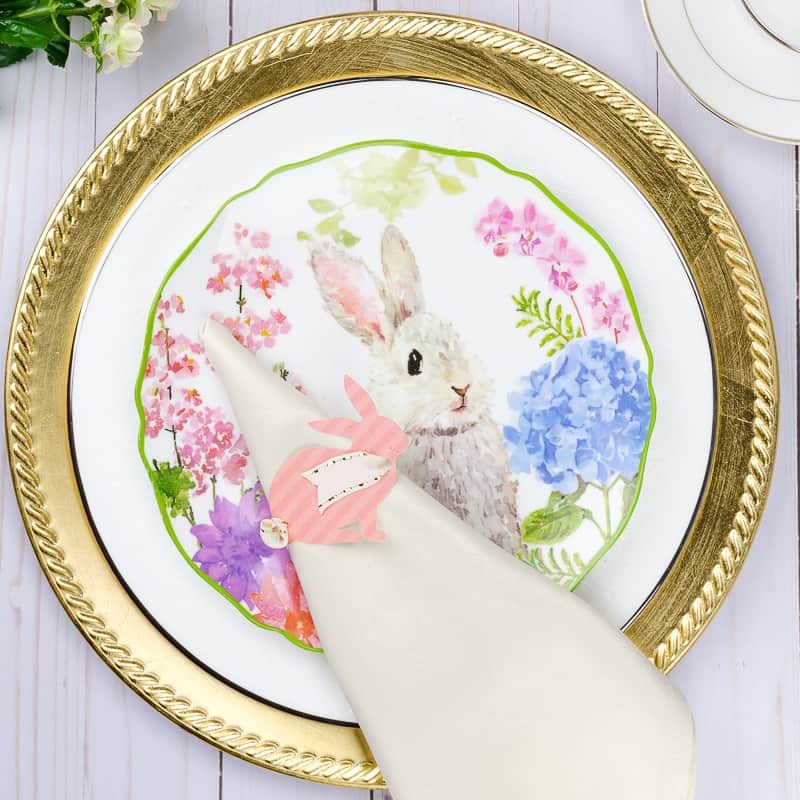 The ribbon has a timeless but whimsical, eye-catching quality that I still adore. Santa’s gifts come in white. When I woke up on Christmas morning as a child, I immediately knew which gifts came from Santa Claus. He always wrapped his presents in pristine white wrapping paper. In a nod to the Santa of yesteryear, I decided to wrap my gifts in a white and red color scheme. I love how the white contrasts with the red and gold ornaments on the Christmas tree. For the final touch, I added a simple red ribbon on the gifts. The best Christmas gifts are always DIY. A few years ago, my sister-in-law gifted us with a framed print that has the words “Wise men still seek him” printed on a chevron pattern. Beyond adding charm to our coffee table tray, it centers us spiritually during the hustle and bustle of the holiday season. What is Christmas without music? I began playing the piano and singing in choirs at an early age, so naturally, I can’t do Christmas without music! Lots and lots of music. This red and white “fa-la-la” pillow added just the right musical reference to our living room. Christmas magic happens when the lights go down. Like many other households, we have magic that happens when the lights go down. I love seeing our living room illuminated by nothing more than the white lights from our mantel and beautiful Christmas tree standing in the corner. Do you spot our little friend nestled underneath the red and gold Christmas tree? Other secrets hide within the tree. 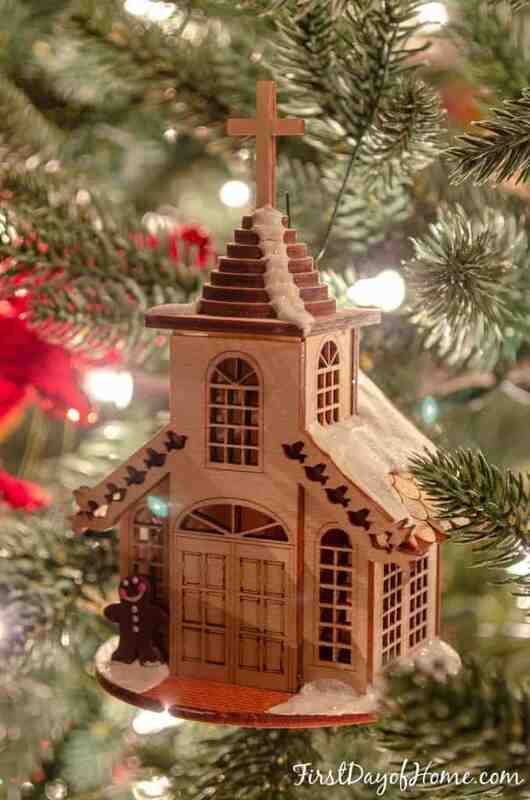 One of my favorite ornaments came from our babymoon in Asheville, N.C. I was very pregnant with twin boys and thought I deserved a memento after the never-ending Biltmore Estate tour! A closer look reveals the surprise…a bride and groom on their wedding day. My boys ask to see this ornament every year! Speaking of surprises, this magic once happened by the red and gold Christmas tree. 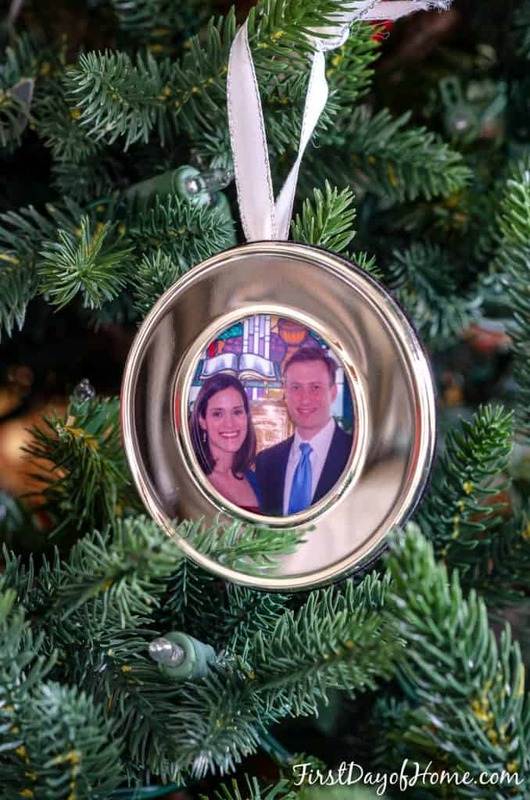 If you know of a couple that recently tied the knot, check out my recent post for top newlywed Christmas ornament ideas. All that glitters is not gold. It could be silver or champagne color, too. Not every room got dressed up in a red Christmas theme. Our dining room has a more neutral metallic feel with blue and white tones. I recently wrote a post about how I made a Frontgate knock-off wreath as a holiday decoration for this room. 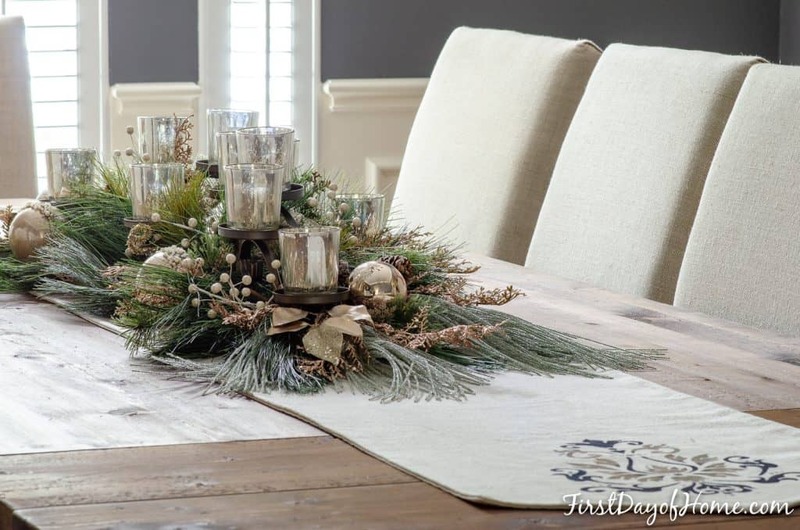 I’ve also since created this DIY holiday table centerpiece with mercury glass to complement the wreaths. 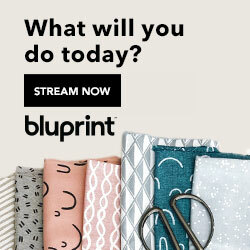 You can also get the full tutorial on the stenciled table runner shown above. When you make friends feel welcome, they will keep coming back. 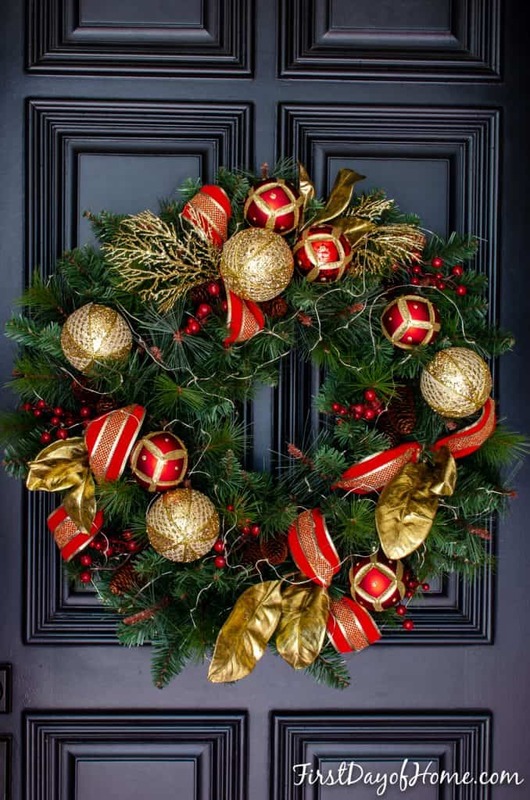 I hope you felt welcome here and got some Christmas decoration ideas for your own home. I look forward to your next visit! 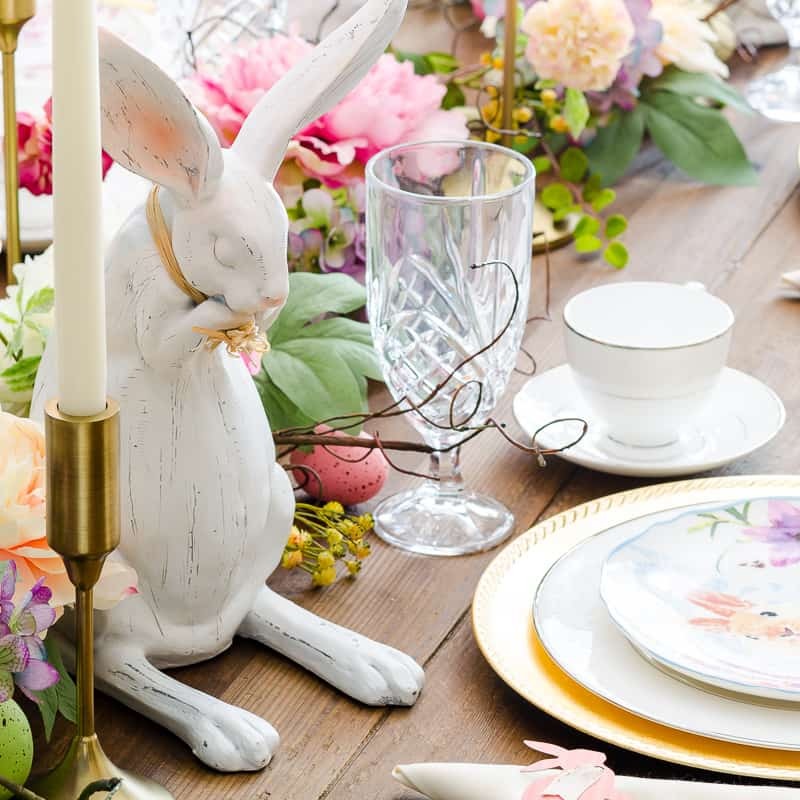 In the meantime, you can visit my Home & Decor and Holidays & Events pages for more ideas. Don’t forget to check out the wonderful bloggers below for more holiday tours! Your Christmas home is beautiful. 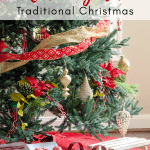 All your touches in your home shows love and the Christmas spirit! Happy New Year! Thank you, Terrie! Christmas is my favorite time of the year. 😊 Happy New Year! 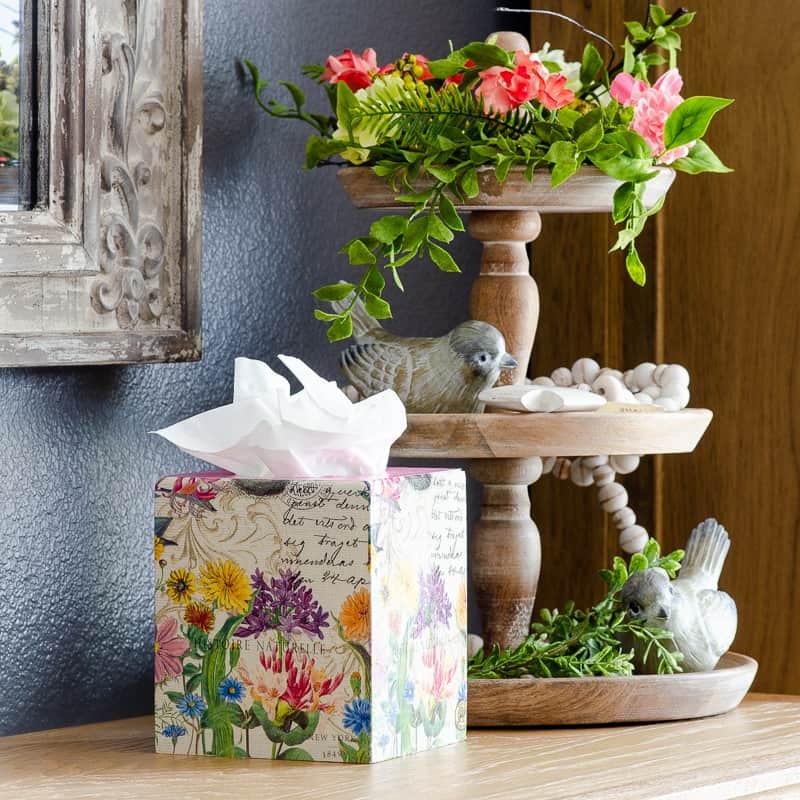 I love all the sentimental pieces in your home! The ornament story is so sweet. Thanks for sharing your home with us! Thanks so much for visiting, Kippi! Merry Christmas and Happy Holidays to you, too! Hi Crissy, I think you must have a magic touch because your Christmas decor is so gorgeous! I love your home and your style so much!! Hugs! I love your decor, it’s very classic and cheery…I also noticed a little Lord of the Rings quote thrown in there ;). Pinned! I love your decorations this year Crissy, they are so beautiful. Something about those memory ornaments, the ones you put up every year that remind you of the past, they are always the best ones. Got me right in the feels. Ha ha! The feels is what I aim to get! 😄 Thanks for the sweet comment. Yes, I love all of those ornament memories! 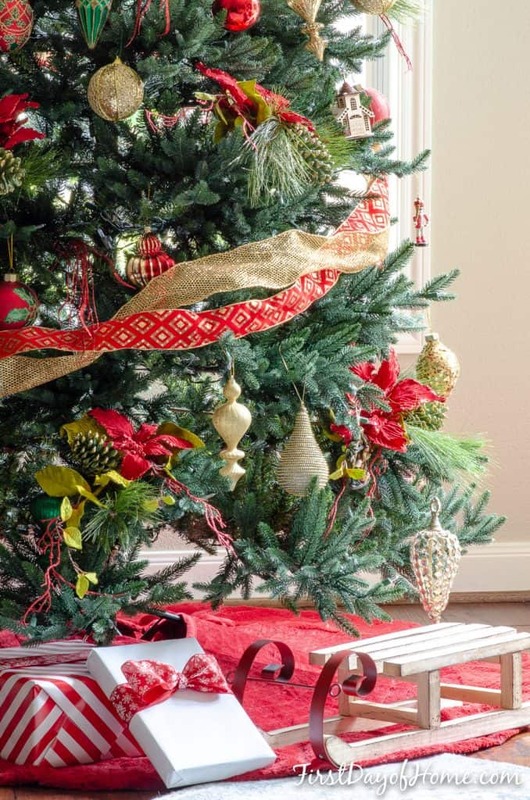 Gorgeous Christmas Decor and pictures!! You Tablescape is so beautiful along with the rest of our home 🙂 Merry Christmas! Just lovely, dear friend! And your photography! I need to get some lesson from you! Pinned! Oh, you’re sweet, Julie! Thank you! Happy to talk photography any time. Thanks for pinning! Wow! 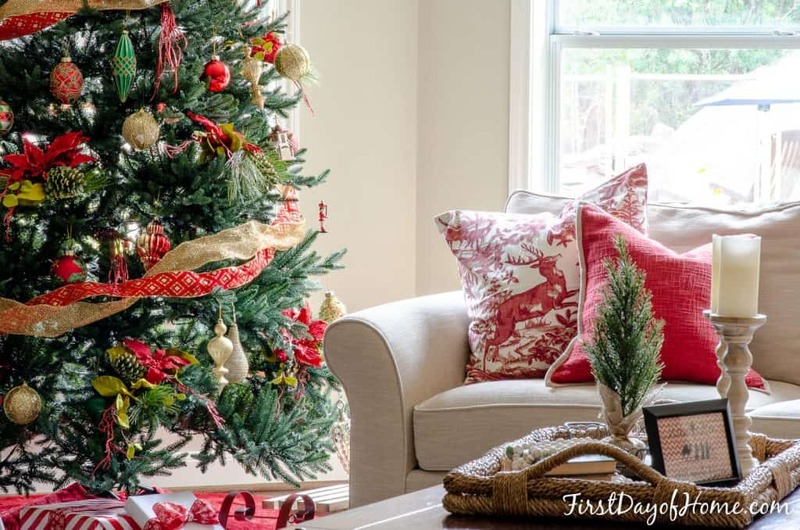 Your Christmas home is so pretty! 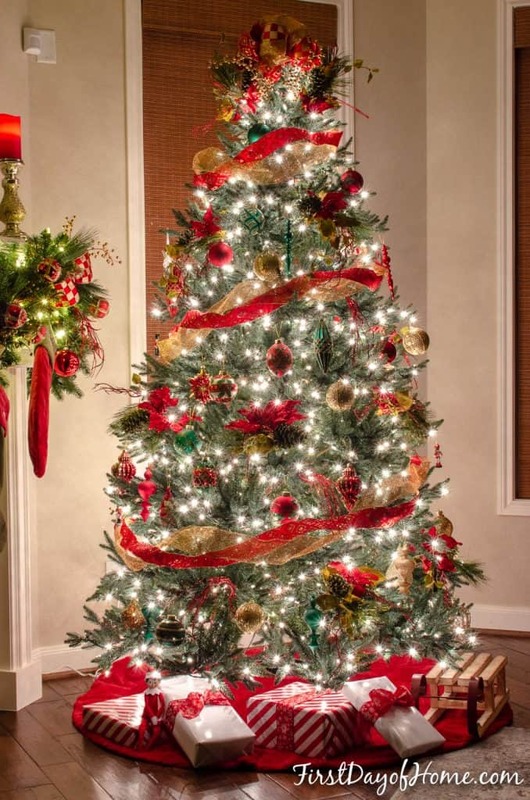 I love your beautiful wreath and fireplace garland, and your tree is spectacular! Happy holidays! Aww! Such a sweet engagement story and I love how your husband proposed through ornaments and a RING! 🙂 I really like that red and gold ribbon that influenced the rest of the decor in your home. Gold is my favorite color! So beautifull the gold looks so elegant. Thank you, Sue! Happy Holidays! Crissy, I’m so glad you took part in our tour this year because your house and decorating is beautiful! 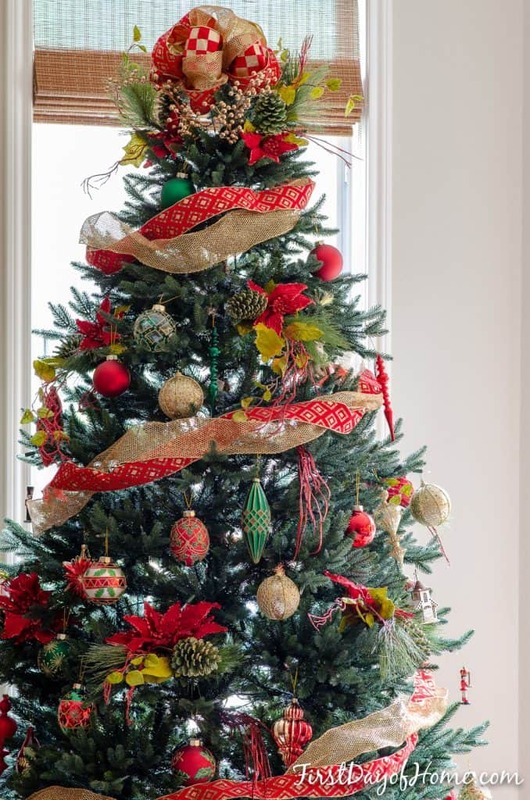 I really love your tree, mantel and your wreaths using red and gold. I also love your selection of pillows and your dining table centerpiece is gorgeous! I love your red and gold decor. Especially all of your Christmas pillows. They are so unique and festive. Loved this tour and hopping with you! I love your red and gold – especially that red and gold checked ribbon. 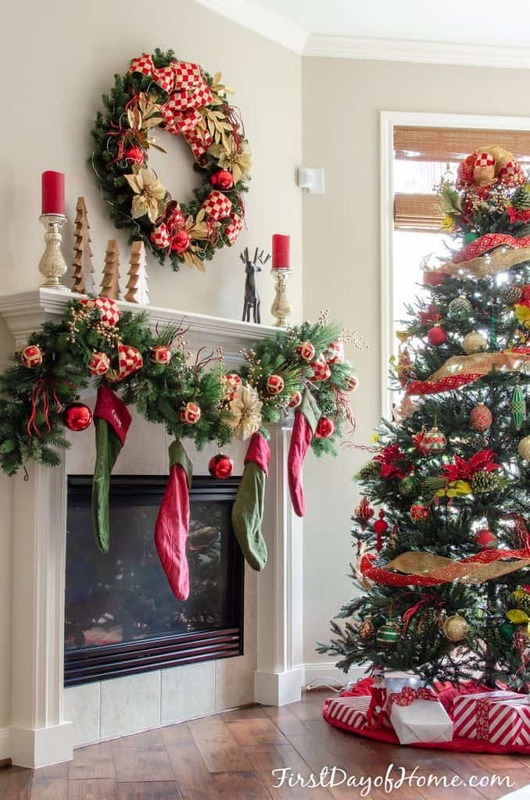 My favorites are your mantel and Christmas tree – gorgeous. Hi Carol! I didn’t see your comment at first! Thanks so much for stopping by, and thanks for the kind compliments. Happy Holidays to you and yours! 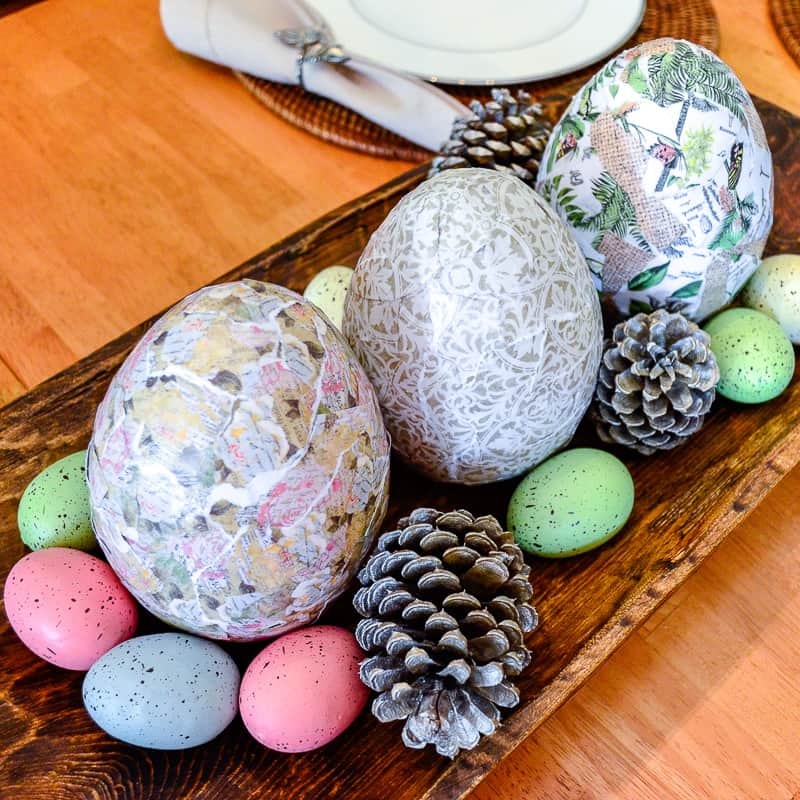 Crissy, I love the personal stories in this post, and your home is so elegant and beautiful! Have a wonderful Christmas! I love the bright red and green on the mantle and tree. 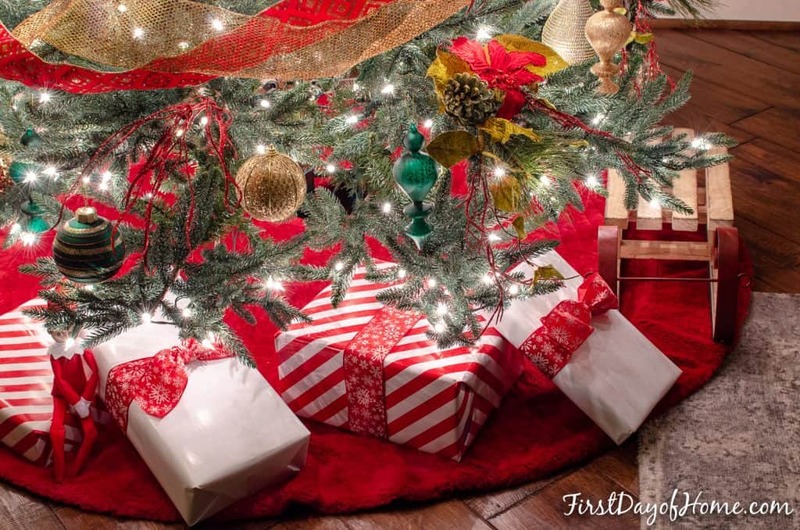 It is gorgeous and I love the idea of the presents from Santa being wrapped in white wrapping paper. I might have to steal that idea. 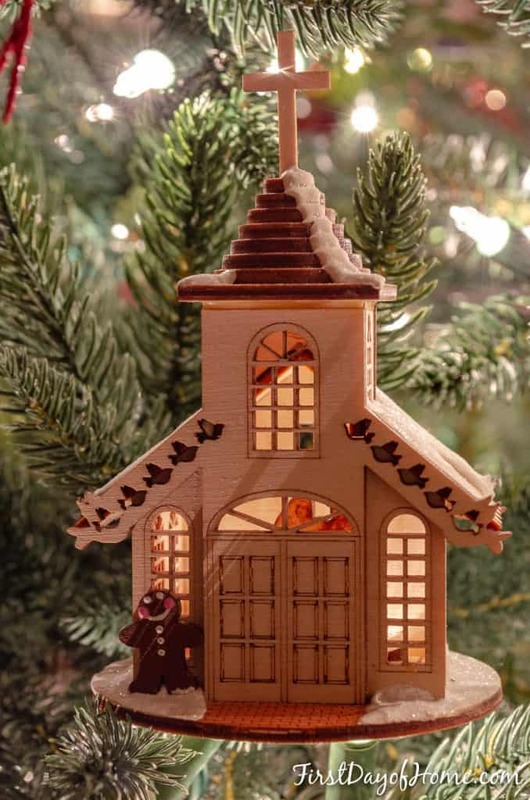 Your home is just beautiful and I am so glad that you joined the Christmas Tour of Homes this year. Thank you, Sherry! And thanks for helping to organize such a fun tour of homes this year. I’m blown away by all of the talent and inspiration. I loved reading the little stories throughout your post, and your tree and mantle are just beautiful! Love that checkered ribbon! 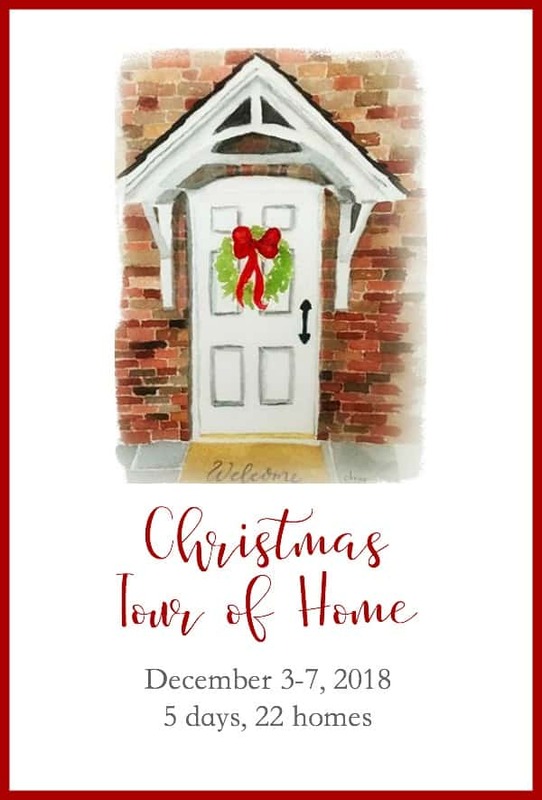 Thanks for joining us this year for the Christmas tour of homes! You’re so kind. Thank you for organizing such a great tour, Nicki! It’s been so much fun visiting everyone’s home all decked out for Christmas! Super impressed with your mantel, wreath and centerpiece making skills. So happy to pin these posts for others as good tutorials are hard to find. 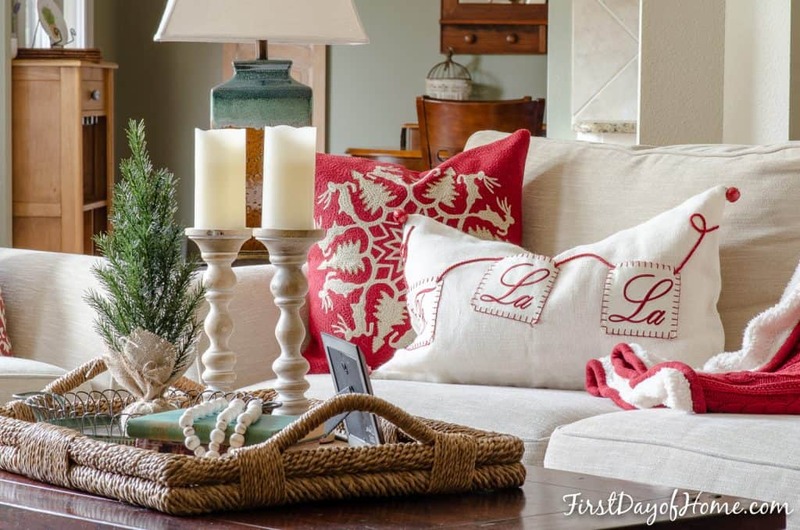 Your red and white theme is beautiful…love your pillows. Congrats on your newlywed Christmas. Enjoy and enjoy!! You’re so sweet, Susie. Thank you! Loved seeing your home on the tour as well and will enjoy reading all of your other great content this year and next! Happy Holidays! Wow!! Your home is so beautiful! There’s nothing more classic that the traditional gold and red this time of year, especially when it’s as stunning as yours! Happiest of holidays to you! Thanks so much, Maria! I forgot to mention in the post that I made the table runner a while back and have a post about that. Glad you liked it! It’s great to meet you on this tour, too!